John A. Lauer is a Senior Partner with the law firm of MacDonald, Illig, Jones & Britton LLP, where he is Chairman of the firm's Trusts & Estates Group. He is also a member of the firm's Business and Tax Groups. John's practice consists primarily of Estate and Tax Planning, Estate and Trust Administration, Elder Law, and Business Law. 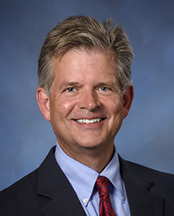 John received his Bachelor of Science in accounting from Gannon University in 1986 and his Juris Doctor from the Wake Forest University School of Law in 1996. He is a licensed Certified Public Accountant in the Commonwealth of Virginia. Prior to beginning his legal career, John practiced accounting for seven years with KPMG Peat Marwick in Roanoke, Virginia. In 1996, John received his license to practice law in the Commonwealth of Pennsylvania. He also received his license to practice law in the State of Florida. John is licensed to practice before the United States District Court for the Western District of Pennsylvania and in the United States Tax Court. John is a member of the American, Pennsylvania, and Florida Bar Associations. He is also a member of the National Academy of Elder Law Attorneys. John sits on the Boards of Directors of Edinboro University Foundation and is a Trustee of the Mercy Hilltop Center. John is the past Treasurer for the Greater Erie Habitat for Humanity and past Treasurer for the Erie County Bar Association. John’s published articles include Disclaimer Trusts: A Wait-and-See Estate Plan and You Can Have Your Cake and Eat it Too.